"During the coverage of the crash of the financial markets in 2008 we heard a lot about ‘animal spirits’. The financial sector is still male dominated and men often seem to talk as if emotions are ‘women’s business’ and they somehow operate in this entirely objective universe .There seemed to be a idea that the market was guided by a neutral ‘dead hand’ and the market was entirely rational but we found out in the crash that it was just as prone to emotional weather as any human system. 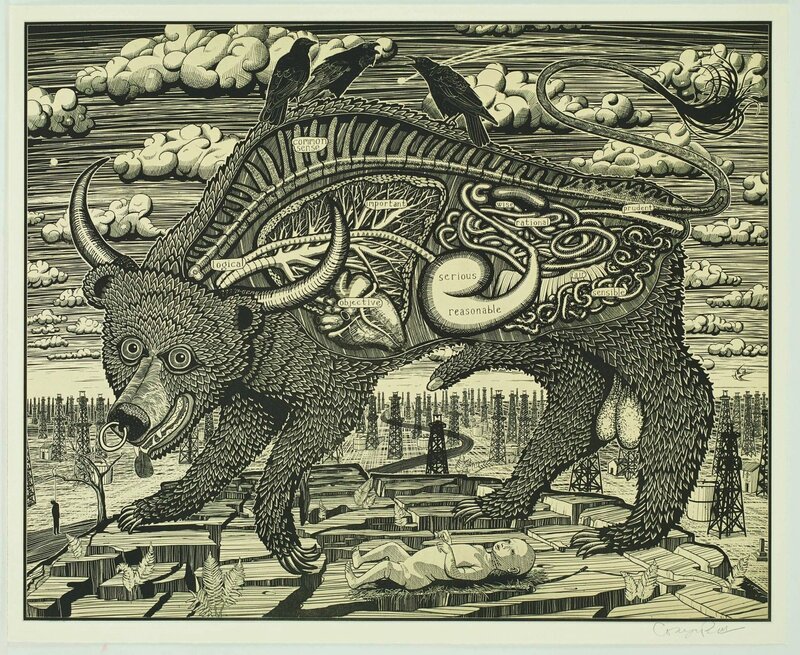 This print shows my symbolic representation of the irrational beast that controls the market, half bull, half bear. He, and it most definitely is a he, is surrounded by symbols taken from the names of patterns seen in Japanese Candlestick graphs. These are graphs that supposedly invented by 16thCentury Japanese rice traders to help them understand the fluctuations in their market and they are still used today on the computer screens of city traders. Certain patterns have colourful names such as Abandoned Baby, Hanging Man, Shooting Star, Dark Cloud Cover, Gravestone Doji, Three Black Crows and Concealing Baby Swallow."